FABULOUS, GORGEOUS TOTAL REMODEL OCTOBER 2018 EVERYTHING IS NEW!!!!! We think you will find this truly a vacation dream with everything picture perfect! NOT JUST A PLACE TO STAY, BUT A PLACE TO ENJOY BEING. This Penthouse Condo combines spectacular Pacific Ocean views and privacy, while feeling you are right on top of the crashing waves!!! It has been remodeled and decorated by one of Kauai's top designers and is modern, charming, beachy, classy, comfortable, and with floor to ceiling and wall to wall windows, you will certainly enjoy the best Kauai has to offer. We love to take the easy 10 minute walk up to the shops of Kukui’ula Village. You will find delightful breakfast spots, lunch hangouts or relaxing restaurants for dinner! Or if you just enjoy wandering in and out of fun boutiques, art galleries, surfer shops or snack on a yummy ice- cream cone from Lapperts..well you will find it an enjoyable retreat. Some of the best snorkeling on the island is just steps away and you are a 10 minute drive from the famous Poipu and Brennecke’s Beach! And don't miss the Brennecke's Broiler right at the beach for amazing sea food. You are in the best location when you stay at Kuhio Shores 414! There is a grocery store super close, so you can pick up what ever you need. You are minutes away from delightful Old Koloa Town, the shops and restaurants at Poipu Village and so many fun sites. It will be a magical, memorable vacation and we are delighted to share it with you! Aloha! We recently stayed in the gorgeous #414 condo at Kuhio Shores! What a wonderful, relaxing week we had! Everything about the stay was perfect. The apartment was luxurious and every little thing was thought of ahead of time to make our stay so awesome! We never tired of hearing the ocean and watching the surfers while sitting on the private lanai overlooking the shore! And that moon on the water at night is breathtaking! There is so much to do in the area and we found so many yummy places to eat close by. We could go on and on but we truly loved our stay!! We will treasure the memories! Thank you Gary and Marce! We stayed in Kuhio Shores 414 recently for 8 days. The 2 bedroom condo was perfect. The views from the deck or looking out the slider was just beautiful. The location is perfect plenty to do at the condo and the condo had everything you needed. Beach chairs, umbrella, coolers, boogie boards. The sounds of the crashing surf from the living room was so relaxing. You could surf, snorkel or watch the sea turtles right from the condo. There were some great little shops a very short walk right down the road with 2 great shops for coffee and breakfast in the morning. We even had lunch twice after returning from the beach there. I would go back to this place in a heart beat. It is one of the nicest places I have stayed and Kauai is the nicest place I have visited so far. If you are looking for a condo with great views of the ocean, walking proximity to the beach for snorkeling, and being lulled asleep by the sounds of the waves look no further than Kuhio Shores. We have rented at Kuhio Shores several times and have never been disappointed. Just watching the turtles alone is worth the price of admission. We currently are going to return to Kuhio Shores this year and are planning to bring our 13 year old grandson for his first trip to the islands. Unit 414 was available over spring break and we quickly booked it last July with Rick and Kathy. 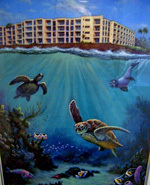 (Unit 414 is on the top floor and these are the most sought after units at Kuhio Shores.) However, we received notice that they sold the unit in October to Gary and Marce. Gary was quick to contact us and let us know that our reservation was secure and everything was going to proceed as planned. Unfortunately, we had to cancel because our grandson had a conflict with the dates we originally booked. I contacted Gary hoping that because we still had almost 90 days he would be understanding and return our deposit. Gary quickly responded to our dilemma by not only understanding that our grandson was the priority here, promised to return our deposit in full (it arrived within 3 days), and included a gift card to a local restaurant that he had planned to give us when we arrived on the island even though we wouldn't be renting from him. I didn't know that this level of kindness, flexibility, and hospitality still existed in our current society! My point in all this is that if you are wavering at all in working with a private owner to rent a condo, please don't even hesitate to contact Gary. Gary is a responsive condo owner who will bend over backward to make your trip to his property a success, and once you see the view of the ocean from the fourth floor his property - Hawaii will do the rest. Thank you so much for sharing your lovely condo with us! We had such a fabulous vacation, it could not have been better. The weather cooperated and we loved watching both the sunrise and sunset each day from the lanai. The turtles even came to say goodbye to us on Sunday morning. And lulling ourselves to sleep with the sound of the surf each night was wonderful. The only thing that we found missing in the condo was a kettle – my son has tea every morning. Other than that, everything was perfect, lovely deco and art. We will definitely check out your vacation property in Carlsbad online. However, we are already saving our pennies for a return trip to Kauai! We had a wonderful time at #414. We have told several others about it, and we plan to rent it from you again. We have been to Kauai several times, but this was the BEST place to stay. The views were fantastic, and the sunsets incredible. The turtles swam below us, and the whales froliced just off shore. We were celebrating our 35th wedding anniversary, and it couldn’t have been nicer. Great dinner at the Beach House, better dinner at Roy's. A highlight? After a couple of Mai Tai’s, we were sitting out on the lanai with our friends (Bernie and Darlene), and we saw a school of incandescent fish! A whole small area lit up with an amazing blue light, which brightened and darkened with bubbles as the fish swam up and down, swam together and swam apart. Then we saw another school. Soon there were about four schools of fish, four areas of blue lights! It was incredible. We watched and watched in awe. B & D had seen some fluorescent fish in the tropics, but Lynn and I had never seen this. Well, you guessed it, unfortunately, our joy was destroyed when we noticed that one of the schools had a beam of light. No, it wasn't Captain Nemo, just four nocturnal snorkelers. It didn't spoil the magic, though. We'll be back! We want to tell you what a wonderful time we had in Kauai. Staying in your condo really made the trip extra special. We appreciated that the unit was well-stocked and had everything we could have wanted during our 2 week stay. The renovations to the unit are tastefully done and we loved all the tropical decor. The beds and pillows were very comfortable, so along with the tropical breezes and sound of the surf, we slept really well! We spent many hours on the lanai watching all the ocean activities. Some days, we found it difficult to pull ourselves away to do touring and exploring - we were afraid we'd miss something! The whales were particularly active while we were there. Thank you for the bottle of Champagne - that was a nice welcome! We hope to be back to Kauai someday. We will certainly recommend your condo to friends. Thank you so much for your hospitality at Unit 414,. Kuhio Shores. What an amazing place! Now that I'm back at work I find myself daydreaming about the sound of the surf, the sea turtles, the mountains. We'd never been to Hawaii before and debated whether to island hop. We all feel we made the right decision to spend all of our time in Kauai and we can't wait to go back. I wanted to see more waterfalls and my family wanted to do more sunbathing, tough choice, huh? Everything was great. Thanks! Will definitely recommend this unit to our friends. Just wanted to take a moment and say thanks for providing such a wonderful place for our vacation. We travel to Hawaii every year and this was by far the best place we have stayed at. This was our friend's first trip to the Aloha State. Your place sure made a great impression on them as well. We had a great time watching the turtles come in to feed every day. I was amazed to see how clearly you could watch them from your balconey. Your place proved to be the perfect spot, as it was central to everything on the island. And as we like to snorkel a lot, it was nice to be able to walk to one of the best spots on the island. Thanks again, and I'll be sure to give your place a high recommendation to my friend when they plan their trips. Although we have stayed in Kauai several times we have always stayed in a hotel - never again!!! The condo changed the entire experience. The beauty of the location and the condo itself was overwhelming!! I think my heart skipped a beat when I first opened the door and saw the living area and the view! We were able to enjoy breakfast every morning on the lanai before preparing for the beach or shopping! I would certainly recommend it to friends and relatives unless it’s at a time we want to stay there:) Thank you so much for sharing a part of your life with us and for making our lovely Kauai experience the best ever! We will return!!! Just wanted to say mahalo for the use of your unit 414! We had an absolutely wonderful week there. We saw three whales from the balcony the first afternoon, dolphins another afternoon, and sea turtles every day. We snorkeled several times from each side of the building, twice out past the break and twice closer to the building, where we saw 10-15 turtles sleeping and swimming. And of course more fish than we could count. What a treat! We also had a wonderful dinner at the Beach House (we were unable to make a reservation with short notice but were able to walk in), and another at Roy's. I want to compliment you on your choice of mattresses - those are the most comfortable beds I have slept on in a long time! We had a wonderful time in Kauai, the condo # 414 is well equipped, quiet, clean, and the location is second to none, We have been to the Caribbean some 20 times many of which at ocean front locations, they all pale in comparison to your unit, why you ask. Each day began on the Lanai (veranda/deck as we call it) with a cup of coffee and at the end of day with a cocktail as we watched those wonderful tropical sunsets. I must say it’s more than an exceptional view, almost hard to explain, but, we found it both soothing and very relaxing near mesmerizing, the constant sound of the surf, the daily turtles, every few days dolphins, entertaining surfers, and the rustle of the tropical palm leaves directly in front; missing it already. The island has so much to offer for sightseeing, one can be as busy or not if you wish. In our two weeks we managed to visit many of the beaches, and left enough for another visit. The Na Pali coast is spectacular; no wonder Hollywood chose Kauai for so many motion pictures. The Kauai people are both friendly with a warm personality, I agree with Conde Nast magazine each year giving the Kauai people top marks for friendliness. Several times as we were out and about someone would wave and offer a smile. I have seen the statement “A house is a place to store furniture” 'A home is a place to store memories'; my wife and I have fond memories thanks to you we felt at home in Kuhio Shores. We will most definitely be returning, and we would like to tell everyone your condo is the place of choice.